One day while scrolling through Instagram, which I do often, I spied an awesome picture by my friend Sam Maggs. She had just been at a con in Canada and purchased some adorable Boyfriend Brooches! Hannah is the creator of the Boyfriend Brooch and I cannot get enough of them! From musical acts, to pop culture icons, Hannah creates adorable lil men that let you literally wear your heart on your sleeve/chest! Already have a special guy in your life? Hannah will even create a custom brooch just for you! I had to know how this perfect and unique idea came to be and Hannah was more than willing to share. 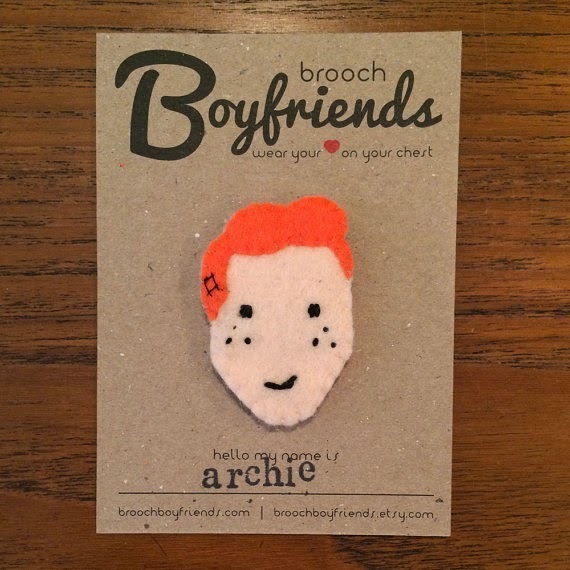 The Nerdy Girlie: In a sea of products, Brooch Boyfriend is one of the most unique and clever ideas I have ever seen! How did this idea come about? Hannah: Thank you! Brooch Boyfriends came about in an unexpected way. I was talking with some friends one day and those old 'Pet Rocks' came up in conversation. I thought to myself "what a strange concept!" but the idea stayed with me. People carrying around something they love... what about people carrying around someone they love? And who wouldn't want to show off that love, in the form of a little felt face? The Nerdy Girlie: From Harry Potter to Archie and even Elvis, each of your lil guys are completely unique and adorable! 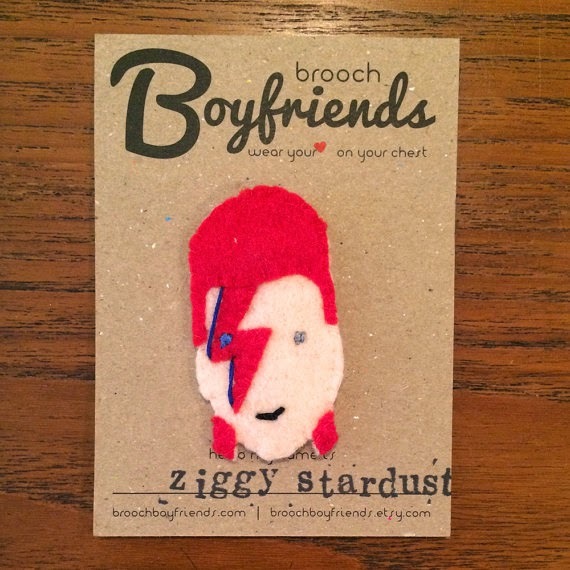 How do you decide which boys you are going to immortalize in brooch form? Hannah: I try to choose people and characters who have something significant about their look, which makes them easy to recognize when I 'brooch-ify' them. Harry has his glasses and scar, Archie has his hair and freckles, Ziggy has his lightning bolt, and Kanye has his chain. 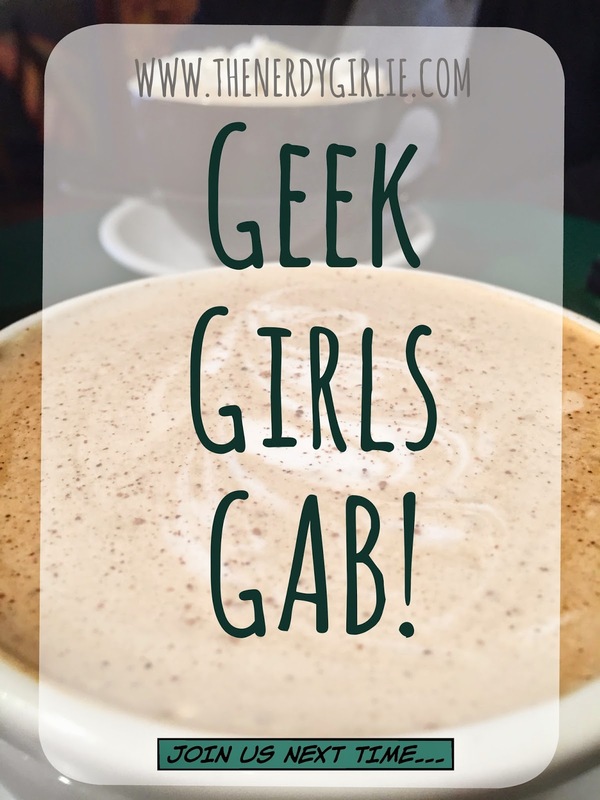 The Nerdy Girlie: I love that you will make custom orders for the already taken gals! How does the process from start to finish play out? Hannah: People will either contact me first or purchase the Custom Brooch Boyfriend listing from my Etsy shop. I ask them to send a photo of the boyfriend they want to brooch, along with a description of their hair colour, eye colour, and any other defining features such as facial hair or glasses. I then sketch out the person, trace the sketch onto felt, cut out the pieces, and stitch him together. I stamp a card with the person's name, pop him in an envelope, and send him on his way to his lucky lady! 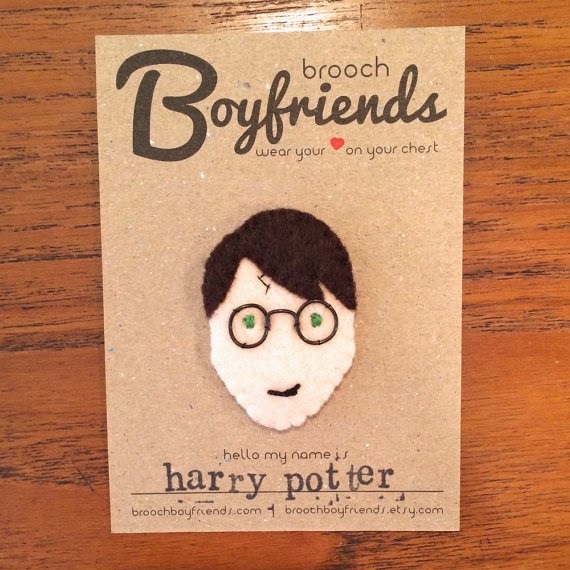 The Nerdy Girlie: As a fellow nerdy girlie, what nerdy Boyfriend Brooch are you wearing? Hannah: My favourite nerdy one has to be Abraham Lincoln. Or as my friend calls him, Baberaham Lincoln. I think it's because I was (and still am) such a big fan of Clone High. Their version of Abe has to be one of my favourite cartoon characters. I switch between wearing Abe and the one of my actual boyfriend, which was my first prototype brooch. He's still going strong! The Nerdy Girlie: I'm sure as a creator you have a notebook filled with ideas! What are some designs we can look forward to seeing from you in the future? I have so many ideas swimming in my head and I've gotten so many suggestions from other people, it's hard to say what's next. Some in the forefront are Andy Warhol, Shakespeare, John Lennon circa the 1970s, Sherlock Holmes (the BBC version of course), and perhaps some more Wes Anderson characters. I'm always open to suggestions! The Nerdy Girlie: Having a custom option in your Esty shop must make for some interesting requests. Do you have one that stands out in your mind? Hannah: The most interesting part about doing custom orders are the custom couples. 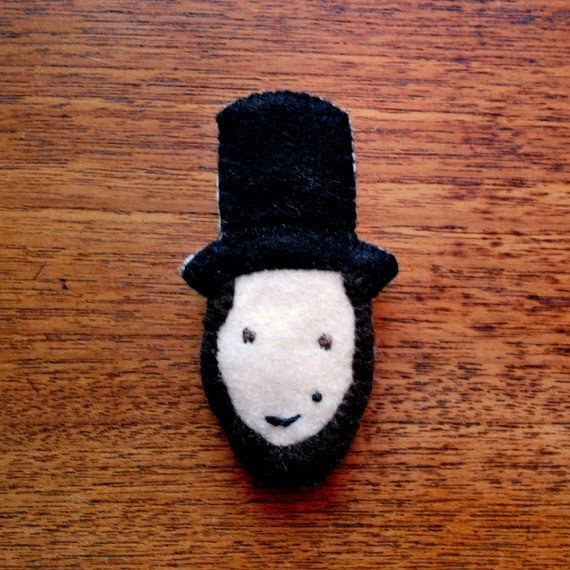 It's neat to see all the different types of people who want to have their faces recreated in felt. A friend of mine commissioned a brooch of her husband, and later surprised me with a tattoo she had gotten of the brooch I'd made! That really stands out in my mind. I was also commissioned to make a Cher brooch complete with afro and long dangly earrings. That one was fun to make! The Nerdy Girlie: I'm sure the nerd guys would want someone special as well! Any chance we will see some Girlfriend Brooches and who would you like to make? Hannah: I definitely get a lot of girlfriend brooch requests. For now I am still doing them on a custom order basis, but I may do a girlfriends series sometime soon. I'm thinking classic girlfriends like Betty and Veronica, Marilyn Monroe, and Cleopatra. Hannah's creations are for sale in her Esty shop, go check them out! Don't see YOUR boyfriend? She does CUSTOM work too! I would love to see either a David Tennant, Sam Witwer, Zach Levi or Nathan Fillion! Speaking of CUSTOM, Hannah has graciously given us ONE custom Boyfriend Brooch to GIVEAWAY here on the blog! Start dreaming of who you would want to wear on your chest and come back to the blog on Saturday October 18th to enter to win! This is awesome and extremely creative! Adorable! Like, so adorable, it should probably accompany the definition, so there's a picture for reference! OMG!!!!!! The Archie..... i just looked and saw there was a jughead too. So awesome.